Finland holiday cottage. 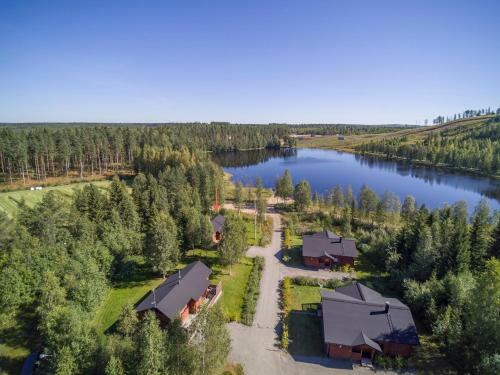 Set less than 300 metres from Häkärinteet Ski Resort, this property offers accommodation on the shores of Lake Tenhunlampi. Each spacious and cosy villa features a fireplace and private sauna. Cabin-style, wooden furnishings and interior decorate each villa at Häkärinteet. The large living room includes a dining area and a TV with DVD/CD player. All villas have a washing machine, drying cabinet and furnished terrace, most with a BBQ. Rinneravintola Restaurant, 300 metres from the villas, offers both a buffet and à la carte menu. On-site activities include beach volleyball, badminton and fishing. Guests at Häkärinteet can enjoy free use of a rowboat, as well as rental of bicycles, canoes, ice skates and ski equipment. A ski school is less than 5 minutes’ walk away.